So I made this ugly cake. 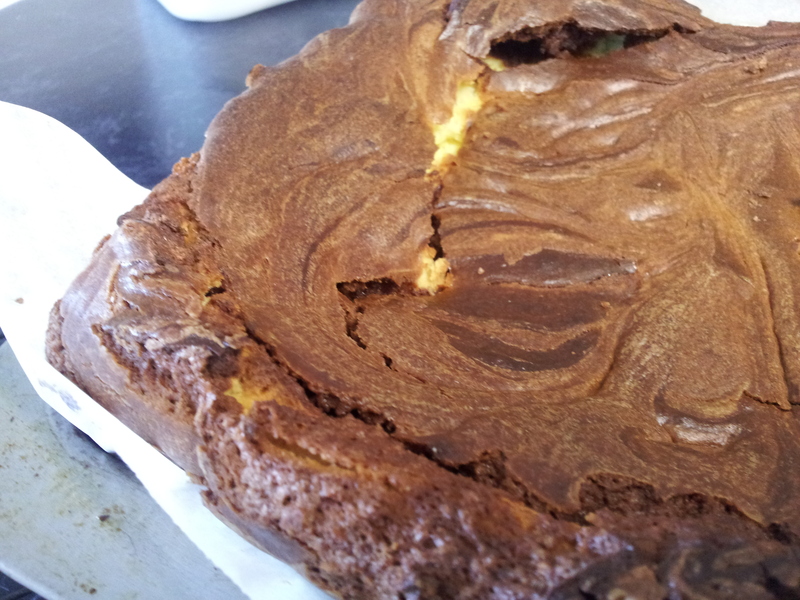 Well actually it was a brownie – a chocolate cheesecake brownie. 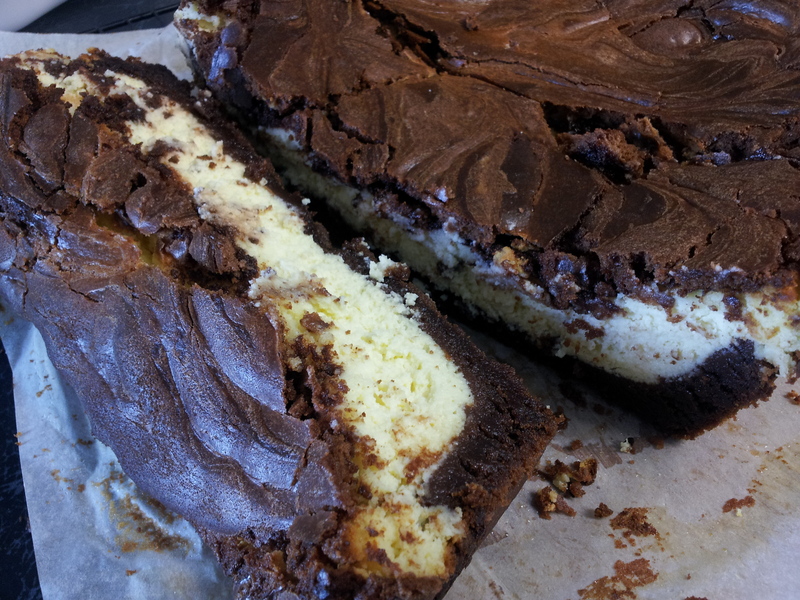 You mix together the ingredients for the brownie base and then you mix together the ingredients for the cheesecake. Two thirds of the brownie mix goes in the bottom of the cake tin, followed by the cheesecake, followed by the last third of the brownie mix. 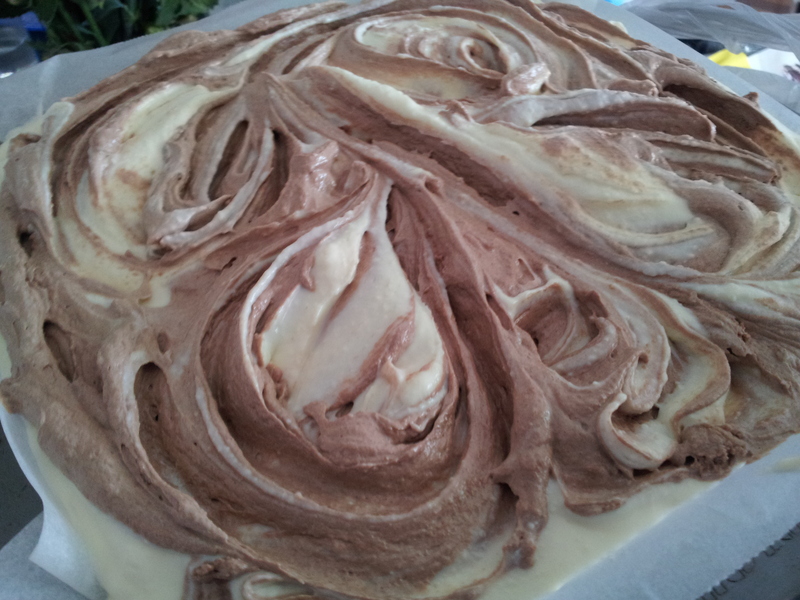 Then you swirl it all around and bake it. Here’s where it got ugly. There was SO much cheesecake mixture. It involved almost a kilogram of cream cheese after all! My gut told me that it wouldn’t all fit in the 24cm square cake pan suggested. I ignored my gut and just followed the instructions. So I spent the next hour nervously watching it bake in the oven. And as I expected, it slowly rose up, up, up and over like warm chocolatey lava. Disaster! It didn’t help that I was in a hurry too. I had planned on taking the brownie out to my parents house for morning tea, but I was running late. After it broke its banks and oozed up and over that stupid little pan I switched off the oven and left it there. I would deal with whatever was waiting for me when I got home. When I got home and opened up the oven, the brownie had kind of sunk violently in the middle with some serious chocolate hanging over the baking paper and cake pan. Cracked, sunken and overflowing – sigh! Every time I tried to cut a nice piece to photograph and share with you lovely people, the cake cracked more, bits fell off, oh it was just a disaster! U-G-L-Y! But, those little bits that kept falling off the cake kept falling in my mouth and, oh my goodness, they were yum! Chocolatey, gooey, chewy, sweet, cheesy, deliciousness! In the end I hacked it into square like pieces and sent it off to work with Mr Picky Palette for his co-workers to enjoy. They didn’t seem to mind ugly cake. Preheat the oven to 160 degrees celcius. Grease and line a 24cm square cake pan. Melt the chocolate in a heatproof bowl set over a saucepan of simmering water (don’t let the bowl touch the water). I melted mine in the microwave – it’s much quicker and uses less dishes! Meanwhile, place butter and 1 1/4 cups (275g) sugar in a bowl, then beat with electric beaters until thick and pale. Add 2 eggs, one at a time, beating well between each. Add melted chocolate and flour, then continue beating until well combined. Spread two-thirds of the chocolate mix in the pan. Set remaining mixture aside. In a separate bowl, beat the cream cheese and remaining 3/4 cup (165g) sugar with electric beaters until smooth. Add the remaining 2 eggs, one at a time, beating well between each addition. Carefully spread cream cheese mixture over the chocolate in the pan. Dollop the remaining chocolate mixture over cream cheese layer, then use a fork to swirl the chocolate through the cream cheese. Bake for 1 hour and 15 minutes or until the centre is just set. Cool completely in pan, then carefully remove from the pan, transfer to a board and cut into 16 squares. A cake only a mother would love!! I wouldn’t say no to a square! Too right Kirsty – that is why I had to get it out of the house! Yummy ugly cake!